Unbeaten UFC featherweight champion Conor McGregor is moving up two weight divisions to fight stand-in Nate Diaz because he will get a big pay cheque. The Irishman, 27, was set to fight Rafael dos Anjos for the Brazilian's lightweight title on 5 March but the champion pulled out with a foot injury. 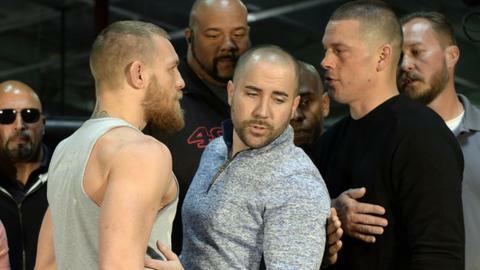 McGregor said: "As long as there's an opponent and a date, you'll see me. "The only weight I (care) about is the weight of them cheques, and my cheques are always super-heavyweight." McGregor is predicting a quick victory over America's Diaz, 30, in their non-title welterweight fight at UFC 196 in Las Vegas. He added: "His soft body and his lack of preparation, he will not be able to handle the ferocity. End of the first round I feel he will be put away. "There's a respect there between us but it's business in there and business is business. He will be KO'd inside the first round." McGregor was looking to make history against Dos Anjos by becoming the first fighter to hold titles in multiple weight classes at the same time. And he was critical of the Brazilian for pulling out of their bout. McGregor, who also distanced himself from Diaz's claims that all UFC fighters use steroids, said: "Dos Anjos has a bruise on his foot. Did ya see it? "It's a bruise. Ice. Ibuprofen. If I jumped under an X-ray, the doctor would slap me and say: 'What are you doing, kid? Get out of here! Stop this.'"